This section is full of Fall crafts for kids that celebrate this season of colour and change. 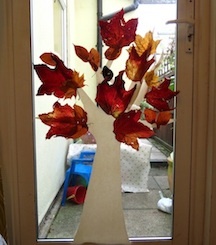 Why not make your own autumn tree, or decorate a robin with leaves? Here you'll find lots of ideas here for your kids to enjoy the season with. 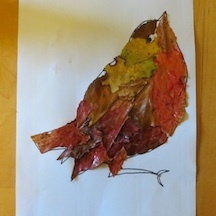 Try decorating a Robin red-breast with autumn leaves, or what about some leaf puppets? Or Fall crafts for preschool aged kids? Here you will find templates and step-by-step instructions for each of these craft ideas. A craft that is really easy, looks stunning and provides fun over a number of days. Make your own tree trunk, collect autumnal leaves, and decorate your own tree! Kids love this craft because it appeals to all ages, can be added to over time, and brings the colours of autumn into your own home! Printing with leaves is a classic autumn craft. 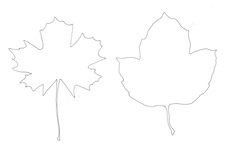 Check out our ideas for printing and using leaves as stencils. These can make great decorations around the home, cards, or why not make a whole sheet of leaf prints to be used as gift wrap!? 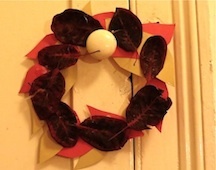 Celebrate the season by using autumnal leaves to make a wreath. Go walking to collect and kick leaves about, and then bring them home and make something lovely! 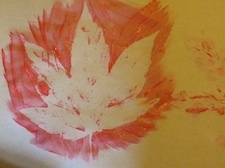 Let your kids use glitter pens to decorate fall leaves. Trace the veins on the leaves and stick them on card or onto your window! This is a really easy fall craft that children of a wide range of ages will enjoy! As the season of fall continues we will be adding more ideas here so do come back and check!